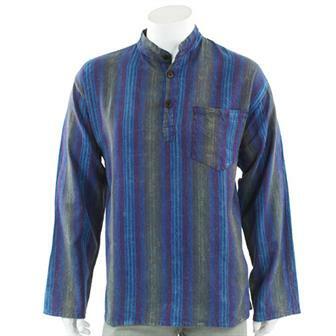 We stock a fine collection of bold shirts including our classic range of Fair Trade stripy grandad shirts from Nepal. 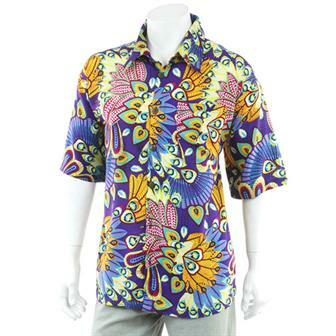 We also have some terrifically tropical and ferociously far out styles that are begging to become your new party shirt! Also available are our rad range of tie dye and printed t-shirts. Wowzers! 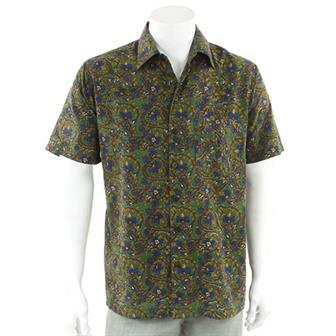 These brilliantly busy patterned shirts feature amazing intricate mandala like patterns. They are available in a selection of fantastically bright colours and are perfect for grabbing attention at those summer festivals! 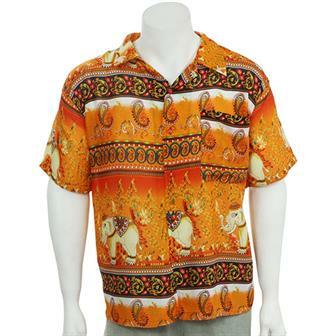 Pineapple shirt...That is all that needs to be said. 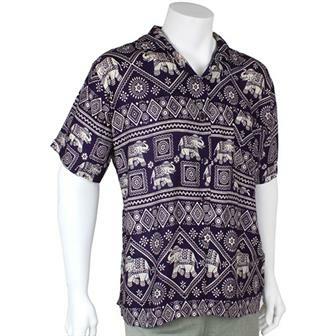 This fabulous shirt is all about being grand with its bright selection of colours and bold printed design featuring paisley patterns and festival elephants. 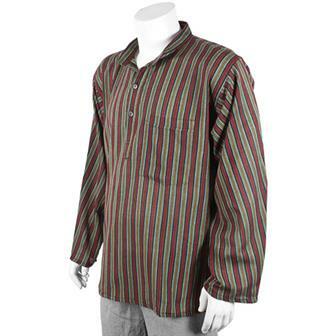 This large shirt comes in one regal size roughly equating to XL. 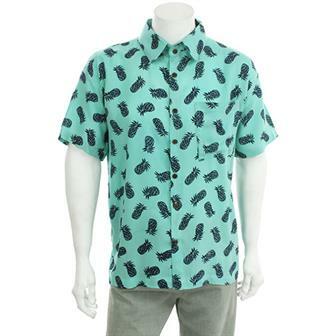 These ferociously tropical shirts are just the ticket. Stay popular at parties, breeze through BBQs and flaunt your flair at festivals, you don't just love summer; you are summer. 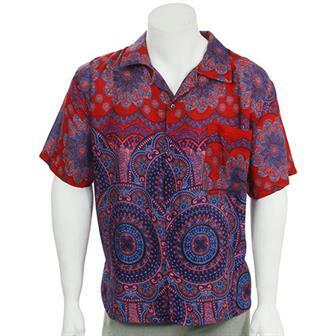 Wonderfully colourful and gloriously loud, these paisley prints are the ultimate party shirt. 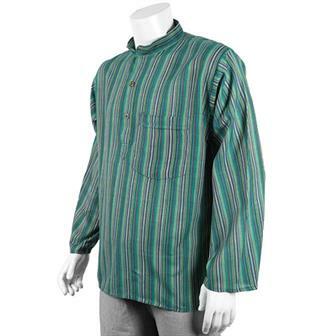 Made in lightweight material with short sleeves, ideal for the summer. 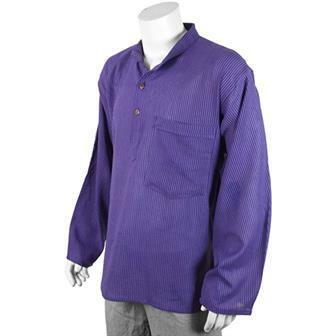 These comfortable and colourful shirts are part of our exciting range of Nature's Dye clothing. 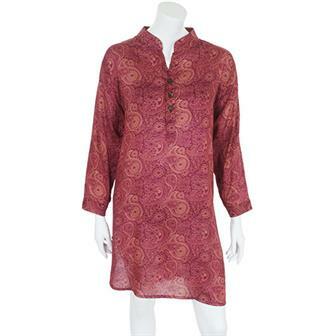 Handmade in India, these great items use only natural dyes to create beautiful, eye catching patterns. 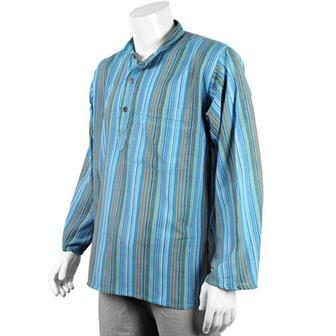 Ideal for hot, sunny days, these lightweight Thai rayon shirts come in a wide range of colourful patterns. 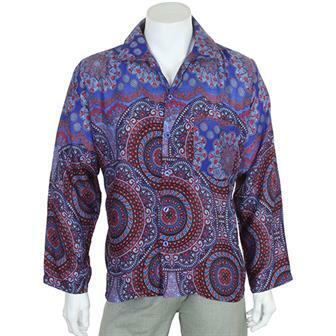 Made in our eye catching Boho Circles fabric, these cuffless long sleeved shirts are sure to stand out in a crowd! Available in a mixture of colours. Made from the same material are our very popular bedspreads, these collared shirts are a bright and eye catching addition to any wardrobe. 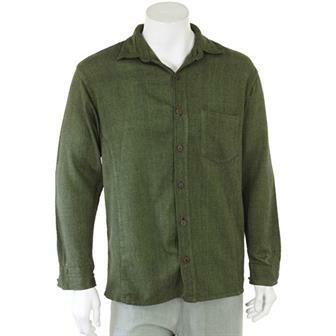 Lovely simple shirts made from a heavier weight cotton than our standard plain shirts, these garments have gone through an additional enzyme wash process which softens the material to make them extra comfy. Complete with breast pocket and polished coconut buttons they are about as smart casual as we get here at Siesta. 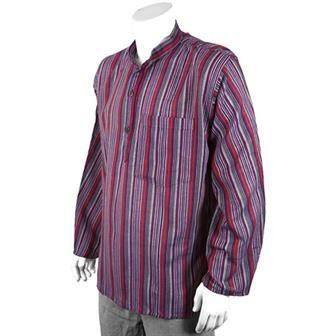 Made in Northern Thailand in a bold array of colours using our Naga heavy cotton material, these western style long sleeved kurta shirts are an all round winner. Finished with a large breast pocket and polished coconut buttons. 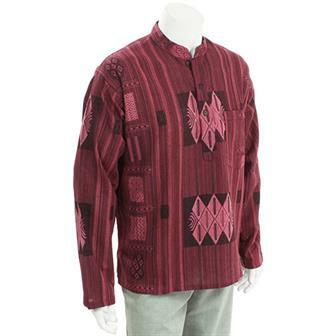 These lovely kurta style granddad shirts are made using a material known in Nepal as Tick-Tick to describe the finely embroidered pattern. 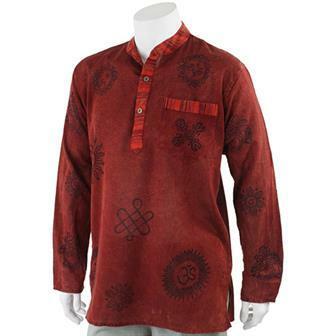 This kurta style shirt is handmade in Nepal and features traditional block print pattern decoration and a stripy hemmed neckline. 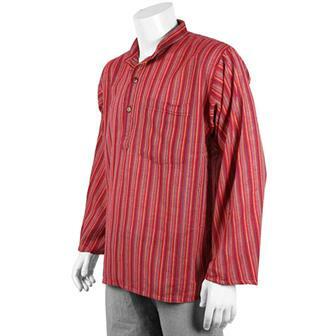 Fantastically stripy pure cotton shirt, also known as grandad shirts or a (western style) kurta. These unisex shirts are a firm favourite for the summer season due to their lightweight nature and comfortable loose cut.